Location: 435 N. Michigan Ave. IMPRESSIVE in its Gothic grandeur, massively tall, serene, majestic, and buttressed to withstand the elements for no one knows how far into the future, Tribune Tower stands a loft landmark over and as a part of Tribune Square, the home of the world’s greatest newspaper. From the bases of its sixty giant caissons, reaching down 125 feet to bedrock, to the apex of its delicately wrought crown, 456 feet above Michigan avenue, It is a marvel of architectural engineering. And in appearance it is admitted by all to be a wonder of architectural beauty. Virtually every one in Chlcagoland and thousands upon thousands elsewhere are familiar with this great gray tower of thlrty-slx stories, with its artistry of classic design and its portrayal in imperishable stone of character and strength. What visitor to Chicago does not look forward to glimpsing Tribune Tower through the canyon of Michigan avenue buildings or from across the river in Wacker drive, to the south and west? Tribune Tower is famous as a structure to be viewed for Its exterior beauty. Among the thousands who have examined Its interior it is equally famous as the mechanical marvel of the age. Combined with the seven story newspaper plant which it adjoins and with the entire basic structure of Tribune Square, Including the W·G·N radio studio building, it is as much a mechanical wonder as any institution can be-even an institution that bears no responsibility of printing news. 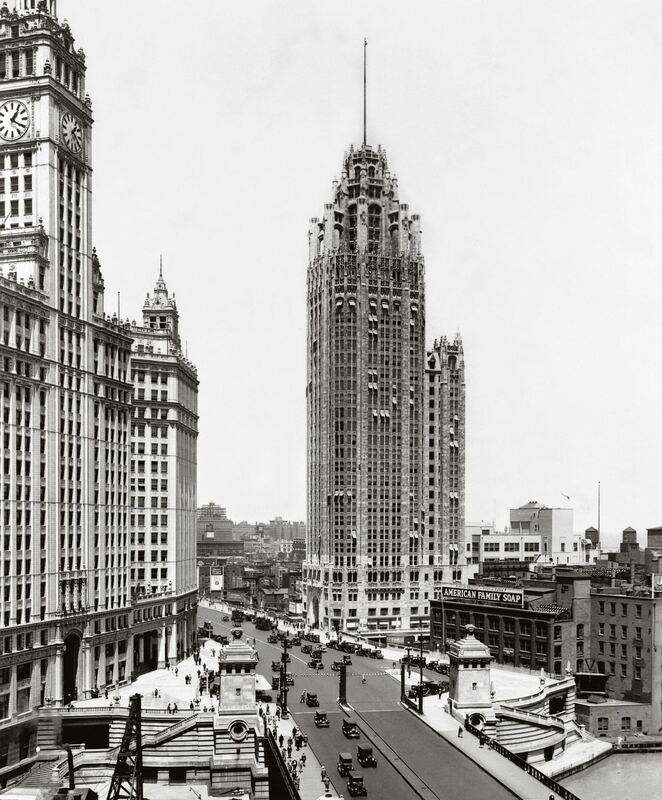 In the Tribune Square newspaper home-tower, plant, and all—are 1,905 electric motors, ranging up to 150 horsepower; approximately 1,200 miles of electric wires, 18,000 electric lamps, and countless ingenious machines, many invented and designed by Tribune men. But before entering into a discussion of these mechanical wonders let us consider the superbly artistic features of the tower part of this newspaper home, from the observatory of which, 456 feet above Michigan avenue, the city and suburbs for miles around can be seen on a clear day. Let us note the imposing entrance to the tower from Michigan avenue, over which is a delicately carved screen of stone called the “Tree of Life,” its symbolic figures being those of Æsop’s celebrated fables and in harmony with the grotesques and other ornamentation employed to adorn the fourth and fifth floor levels of the building. Let us pause before the facade of the building to give attention to the historic stones embedded in its surface. There are more than thirty of these stones in the walls of Tribune Tower, each identified in letters carved beneath or at one side. From the world’s most famous structures have come these stones from the Taj Mahal in India, from the Great Wall of China, from Hamlet’s castle in Denmark, from old Fort Santiago at Manila, from near and far all over the globe have been collected these historic rock fragments to stud the surface of this notable tower. On the W·G·N studio building, which stands by the side of the tower, are other similarly historic stones. When one passes through the front entrance of the tower into the lobby his attention Is immediately drawn to the striking mural which adorns the east wall just opposite the entrance. The mural, 16 feet wide and 23l½ feet high, is entitled “The Freedom of the Press.” It depicts the age-old struggle for liberty of utterance, either vocal or by the printed word. It Is done in pastel crayons on paper, In burnt sienna, black, and reds. 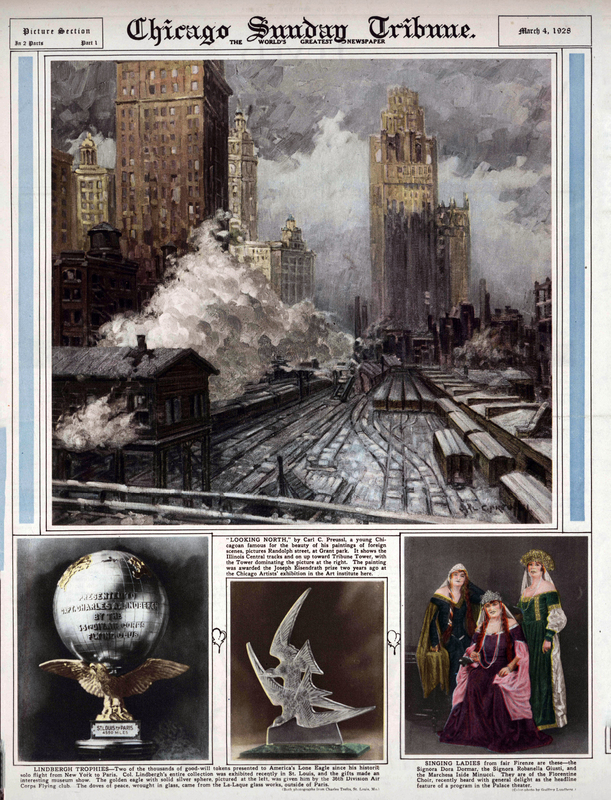 The designing artist of this imposing work is Mrs. Clara Fargo Thomas, distinguished mural painter of New York and member of the National Society of Mural Painters. Carved in the travertin marble of the walls of the lobby are famous and cogent lines, Including those of the first amendment to the national constitution. Among those quoted in this everlasting manner are St. John, Euripides, Junius, Daniel Webster, Patrick Henry, the Presidents Madison and Jefferson, Chief Justice Hughes, and Joseph Medill, who for many years was the guiding genius of The Tribune. This tower, which, as the above quotation discloses, was built with the idea of permanency in the minds of the builders, is the eighth home of The Tribune, counting as one it and the other structures in Tribune Square. The first home of The Tribune consisted of one room in an old building at Lake and La Salle streets. That was in 1847. Two years later The Tribune moved to more commodious quarters in a room over Gray’s grocery at Lake and Clark streets. Another year and another move this time to a building at what then was 173 Lake street. In 1852 The Tribune occupied its fourth home, in Clark street between Lake and Randolph, on a site now covered by the Ashland block. This was a three story building which for a time adequately took care of the newspaper’s growth. 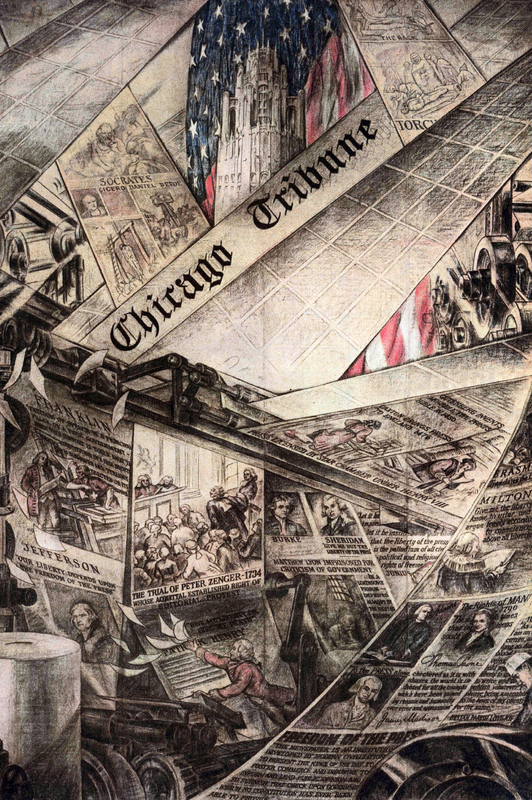 In 1869, four years after the close of the Civil war, The Tribune was installed In the first building of its own construction, a four-story structure at the southeast corner of Dearborn and Madison streets. In 1871 came the great fire. The Tribune was burned out but not In the least discouraged. It missed only two issues of its newspaper, those of Oct. 9 and 10, moved into temporary quarters in Canal street, and began rebuilding the second Tribune building on the Dearborn-Madison site almost immediately. The new structure was of five stories. The arrival of the twentieth century found this building, which in the seventies seemed so large and fine, thoroughly Inadequate. A seventeen-story skyscraper home was completed in 1902 on the site of the two preceding buildings. This is the building in which The Tribune’s downtown publtc service office is located. When this tall structure was put into service as a newspaper plant thirty-six years ago it was thought that the future of The Tribune had been taken care of for generations to come, but before fifteen years had passed the newspaper had outgrown this home. It needed more spacious quarters, more room for expansion. And so came about the erection of the present newspaper plant part of Tribune Square, a seven-story structure, 100 feet wide and 167 feet long. This was In 1920,and only four years later the paper again had outgrown its quarters. Improvement of still more of Tribune Square became necessary. The result was Tribune Tower. It was decided to hold an architectural competition open only to licensed architects for a design for the most beautiful office building In the world, to be erected In front of and adjoining the newspaper plant proper on a space 100 feet wide and 135 feet long, the building to face on Michigan avenue at number 435 North. It would be seen at close range, had to be artistically ornamented. Its crown, because it would be observed by countless thousands from varying distances, had to present a pleasing appearance-a beautiful silhouette. Its two extremes had to be tied together with harmonious lines. Thus were provided In its de. sign the many corbels that stand out from its exterior walls, and those giant flying but. tresses, seven stories high, that adorn the upper part of the tower. Future plans contemplate an improvement of all of Tribune Square in a manner in harmony with the existing tower-with a building or group of buildings of the same general architecture as the tower. What the final development will be will depend upon conditions and needs at the time the new construction is undertaken. So far as can be visualized at present the tower will be the nucleus of any group to be erected in the future. 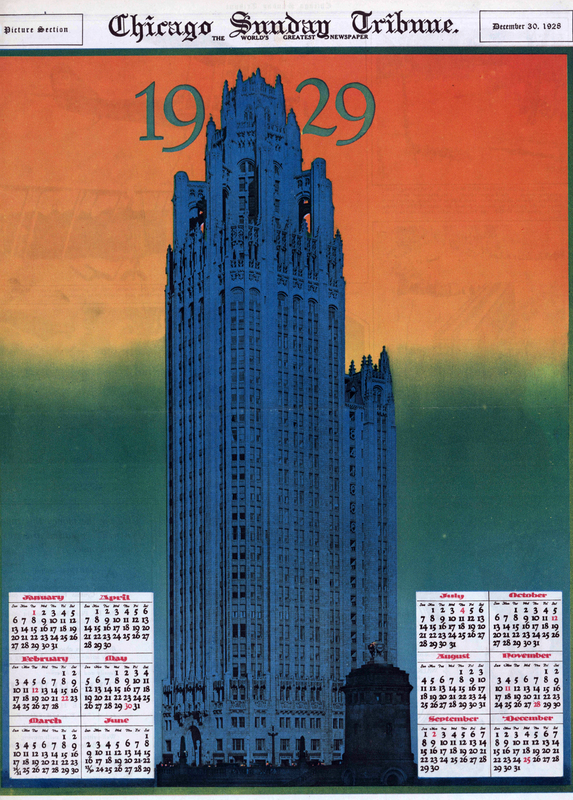 Completed in 1925, Tribune Tower was, and still is, a remarkable contribution to American architecture. What a few perhaps do not know, however, is that It is as much a mechanical as an architectural wonder. 25. Senate Press Gallery, Washington, D. C.
31. Mosque of Saint Sophia, Constantinople. Church built in 548. Visitors of All Walks, from Far and Near. The Tribune Tower opened its doors yesterday. Everything. was prepared to handle a crowd of perhaps 2,000 persons. Twenty thousand came, it was estimated. Judges and society matrons, folks from out of town, a mother with a couple of perspiring children dragging at her arms, a sister in her heavy black robes, a fellow who boasted he read The Tribune for thirty years, all these and many more packed themselves into the lobby of the Tower and over every one of its thirtY-four floors. As they came up to the Tower they stopped a moment to gaze up at the smoothly curving arch of the entrance and to murmur over the pierced tracery of the screen above the doors. They loitered to real the bit of carving beside some of the famous stones that are set Into the walls of the Tower. One from Westminster abbey, one from the Taj-Mahal, another from a Chinese temple, and one from Yale and one from Princeton. Before entering they backed away until they could see to the very top of the flagpole nearly 600 feet above the sidewalk. The flag was six feet by twelve. It looked like a red, white, and blue handkerchief from down below. Inside the lobby with its ceiling of great beams and its cathedral like carvings in stone and in old English oak the crowd was thick. It formed a semi-circle about the round stone in the center of the floor where the words of Ruskin, from his “Seven Lamps of Architecture” are carved. Flowers, the gifts of well wishers to Col Robert R. McCormick and Joseph Medill Patterson, co-editors of The Tribune stood in baskets about the walls. Those who came early enough, or just late enough, were able to get to the top of the Tower without trouble. But in the middle of the afternoon when the crowd was thickest, the observa. became so jammed that it was necessary for a time to restrict visitors to the Tower top to those with guest cards. The fastest elevators In ChIcago, traveling 800 feet a minute, carried the visitors to the 24th floor. Up there, where are the of the editors, the of the editorial writers, and teie library, they found the wails done In rough plaster, painted a creamy yellow, with the woodwork of oak. Up a flight to the 25th floor the crowd walked, and out on the lower promenade. They found that the alry buttresses that had looked pliantly delicate from below now pushed up from the masonry at their feet. They discovered the spidery columns were themselves towers, many feet through and tall as giant trees. Guides under the direction of Holmes Onderdonh, manager of Tribune real estate, directed the visitors and answered their questions The visitors learned that the flagpole, for example, was 110 feet tall and that the Tower itself went down for seven stories below the street level. Some took the single elevator that runs above the 24th floor. Others wailing to for the one car taxed beyond capacity climbed the stairs to the very top of the platform inside the topmost crown of carved stone. 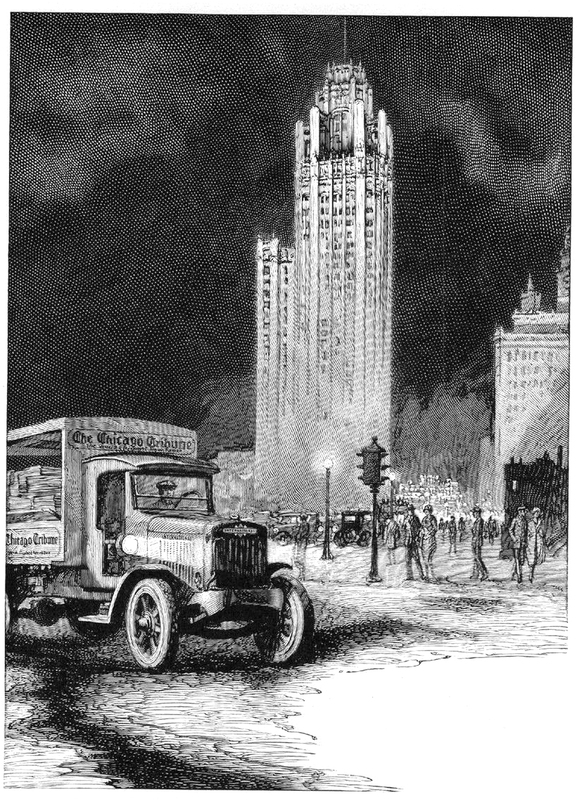 Such was the opening of Tho Tribune Tower. Toward the end of the day the management received a telegram from Mr. and Mrs. Charles H. Wacker. Mr. Wacker Is hend of the Chicago plan commission. It was one telegram among many, but a phrase in it seemed to sum up the day. There Is eloquence In stone and steel. There is inspiration In good architecture. There is character building in good surroundings. 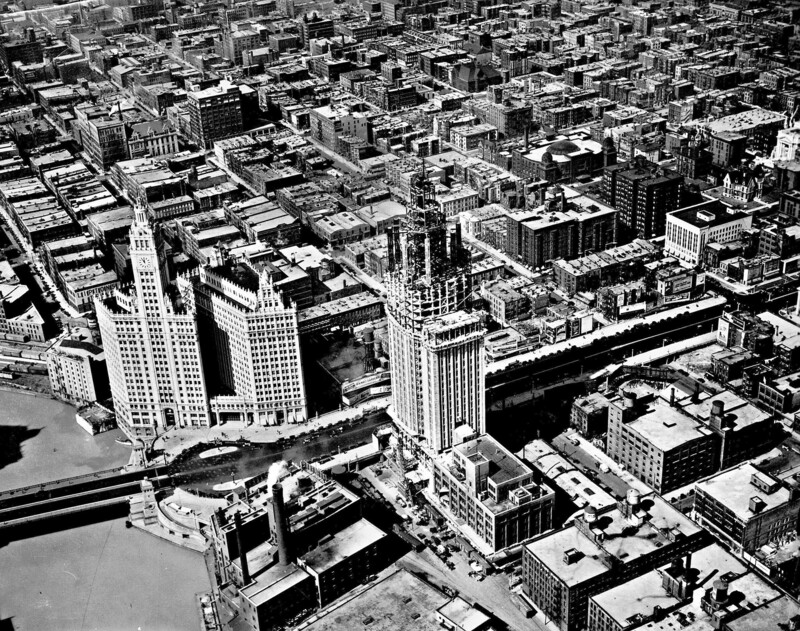 A bird’s-eye view of the construction of the Tribune Tower is shown in 1924. LONDON, Feb. 3.—An unsolicited testimonial to the beauty of The Chicago Tribune Tower appeared in St. John Ervine’s article on Chicago in the London Observer. Considerable space is devoted to a glowing eulogy of the city’s most distinguished building. I have no hope of being able to describe the beauty of The Chicago Tribune Building. The delicacy with which this tower soars into the sky is astounding. I would not have believed that so much tenderness could be achieved in steel and stone, yet here the incredible thing is done. 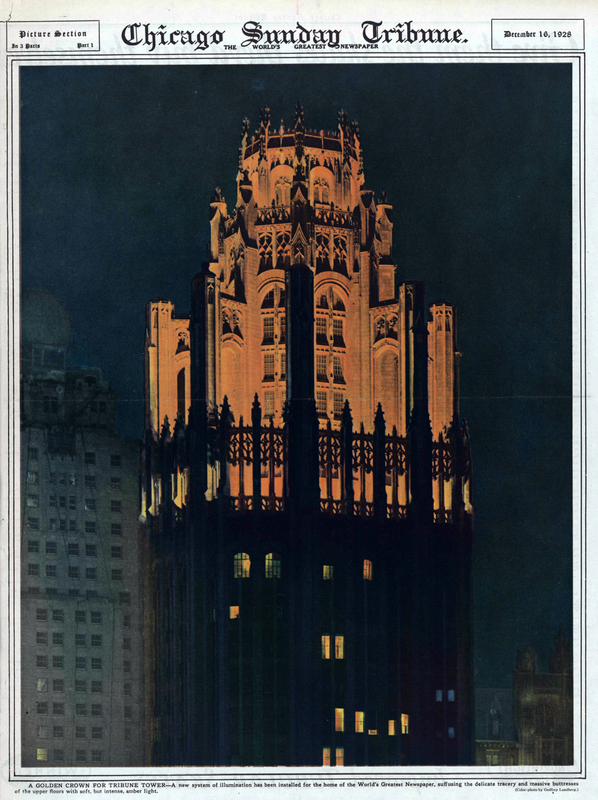 The Tribune Tower is lovely in daylight; but lovelier still at night when it stands high above the dusky town lit up with concealed lamps that throw soft gleams along its lines so that parts are clearly seen and parts remain in the shadow. Late in the evening I saw the skyline. 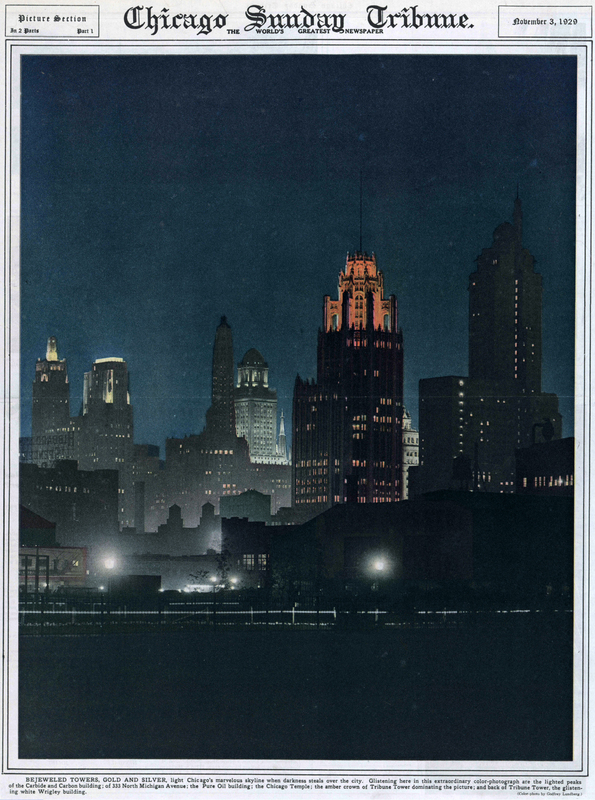 It was a lovely sight, but the loveliest thing of all was that dark and illuminated mass of building—The Tribune Tower, delicate as a lady’s hand and as firm as a man’s. 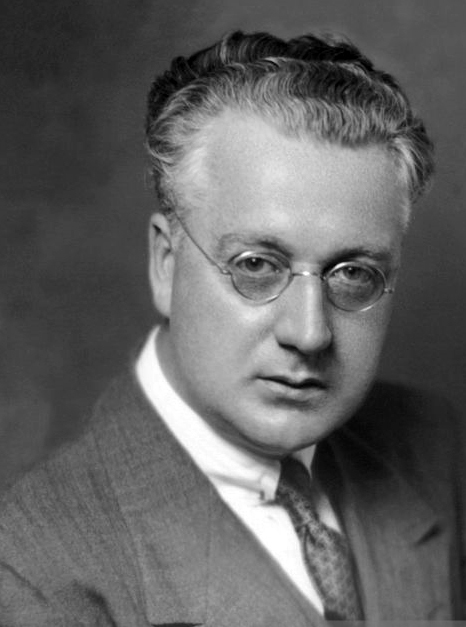 The readers of Mr. Ervine’s article received a much more just impression of Chicago than is obtained in news stories in the British press about the gangs and the fulminations of Mayor William Hale Thompson. Thugs and gangsters undoubtedly exist, but it is easily possible to live in Chicago and except for reports in the newspapers, remain unaware of their existence. This city, which less than 100 years ago was a village of 300 inhabitants, contains a more varied population probably than any other city in the world, and the job of governing this polyglot people is a hard one. The growth of Chicago was too rapid at the time when utility was all the rage, but there is a social consciousness spreading throughout the city and its citizens are resolved to make it the greatest town in the world. I believe they will do it. I believe they will eventually make Chicago the most handsome city in the world. There is a vitality in this place that is amazing. Chicago is a city of shining towers, a city which one day, I believe, will excite the envy of all civilized men. It is in this place and not in New York that the genius of America is found. Here is energy, here is bewildered, but indubitable strength, here, too, is emerging beauty. A new system of illumination has been installed for the home of the World’s Greatest Newspaper, suffusing the delicate tracery and massive buttresses of the upper floors with soft. but intense. amber light. light Chicago’s marvelous skyline when darkness steals over the city. Glistening here in this extraordinary color-photograph are the lighted peaks of the Carbide and Carbon building; of 333 North Michigan Avenue; the Pure Oil building; the Chicago Temple; the amber crown of Tribune Tower dominating the picture; and back of Tribune Tower, the glistening white Wrigley building. by Carl C. Preussl, a young Chicagoan famous for the beauty of his paintings of foreign scenes, pictures Randolph street, at Grant park. It shows the Illinois Central tracks and on up toward Tribune Tower, with the Tower dominating the picture at the right. The painting was awarded the Joseph Eisendrath prize two years ago at the Chicago Artists’ exhibition in the Art institute here. 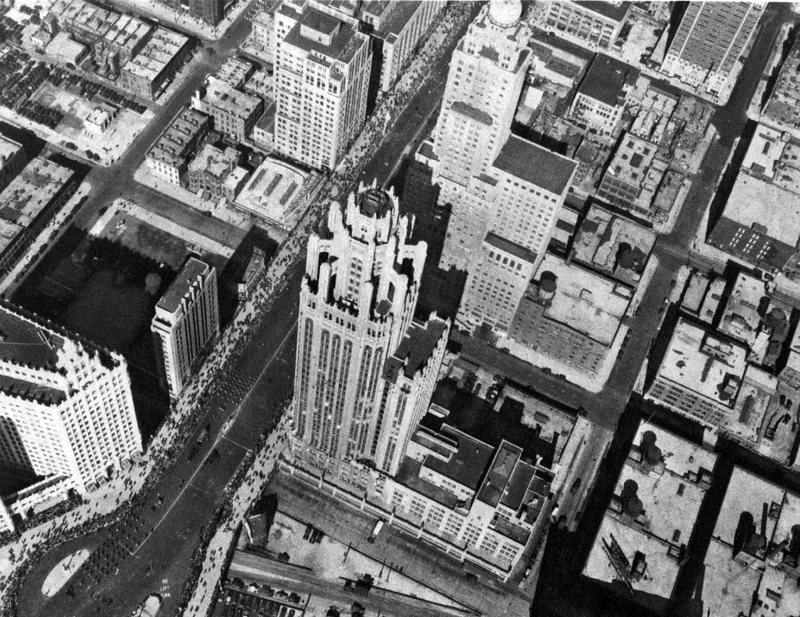 A unique view of Tribune Tower, photographed from the air during the American Legion parade. Photo by Air Corps Technical School, U. S. Army. Tribune Tower, the historic Michigan Avenue home of the Chicago Tribune, is for sale. The building’s owner, Tribune Media, announced Thursday that it has hired real estate investment banker Eastdil Secured to explore an outright sale or partnership for redeveloping the 36-story building, which sits on 3 acres along one of Chicago’s busiest shopping districts. “The global renown of this building, its unparalleled location and development potential make this an incredible opportunity and we are expecting a high level of interest from a broad range of private and institutional investors and developers,” Murray McQueen, president of Tribune Real Estate, said in a statement. Tribune Real Estate unveiled conceptual plans last year to redevelop the parcel, potentially tripling Tribune Tower’s space with residential, retail and hotel components. The landmarked neo-Gothic building, which houses the Chicago Tribune and other tenants, has 737,000 square feet of space but is zoned for up to 2.4 million square feet. Chicago Tribune Delivery Truck by International Harvester Co. 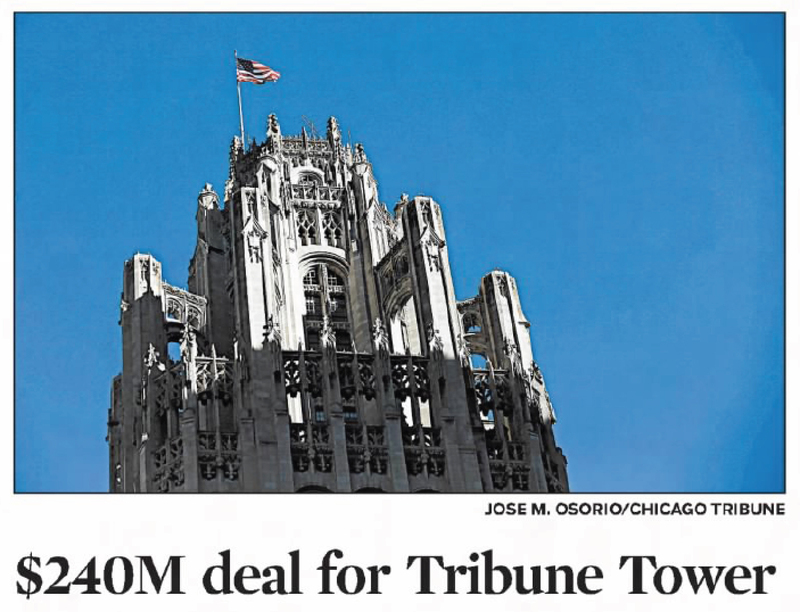 Developer CIM Group has agreed to buy the Tribune Tower for up to $240 million marking the end of media ownership for the historic North Michigan venue building. Chicago-based Tribune Media has been shopping the property since October. Trone, the publishing company parent of the Chicago Tribune, is the building’s biggest tenant.